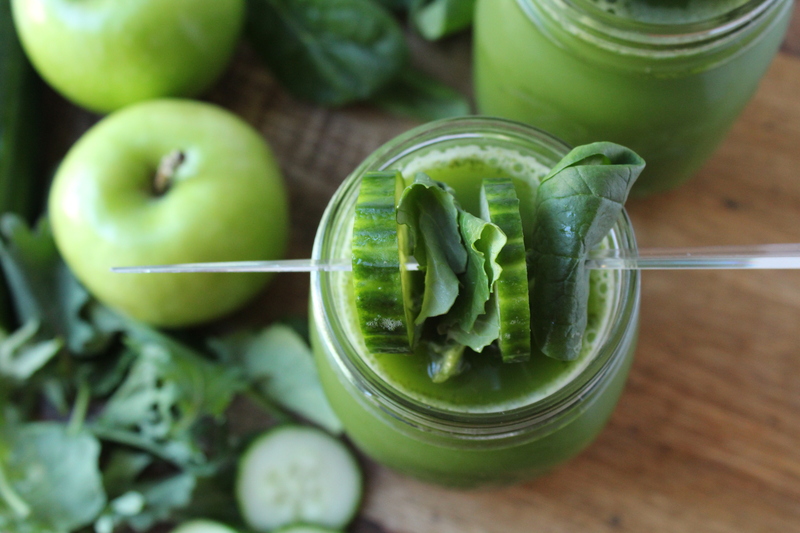 My favorite homemade green juice is crisp, tart, refreshing, nourishing! There are a few food items that make me feel like a total boss. Green juice is one of them. I love making it! When you drink this, you just know that you are putting nothing but goodness into your system, and that feels great! Fresh juice is packed with nutrients that the body needs. We should be kind to our bodies. We should put effort into the foods we prepare for ourselves and our loved ones. Personally, I like my green juice on the tart side. If you are just getting into the flavors I suggest adding in an extra green or red apple for added sweetness. This recipe developed from a juice I had at Jamba Juice. The flavors are very similar but by making it myself, I don’t have to pay $6-7 for one small juice. I have an inexpensive juicer from Target which was about $50. I’ve had it for over two years, and it has been a great investment. A money-saving tip I have if you are making large amounts of juice is to shop for your produce at Costco or Sams Club. If you are making smaller amounts for one or two people then Trader Joe’s is also a great place to shop. You can find high quality ingredients for great prices there. Make yourself this green juice or your own blend by choosing your favorite ingredients. Let me know what your favorite juices are! 1. Wash and cut all fruit and vegetables into large pieces depending on the size your juicer is able to use. Set up and turn on your juicer. 2. Begin adding cucumber, celery, apples, kale and spinach to juicer. After adding a handful of kale or spinach, follow it with a juicy fruit or vegetable such as cucumber or apple. This will help the leafy greens be juiced better. 3. Once all fruits and vegetables are juiced turn off juicer and remove juice. Add in a squeeze of lemon juice and stir to combine. Let chill in the freezer or refrigerator until very cold or serve over ice. • Optional Step: Add one cup of the fresh green juice to your high speed blender with a handful of baby spinach and/or baby kale. Blend it until very smooth then add back into your remaining green juice for added nutrition. • Regular kale has a bitter flavor. Baby kale is milder and has a better flavor in juice. • Always wash your juicer immediately after each use. It is very easy to wash if the fruits and veggies do not have a chance to stick to it. Sounds like a great recipe! I will definitely try this over the weekend. Thanks for the baby kale tip as well 🙂 I really dislike the bitterness of regular kale in general! Perfect! There’s a Trader Joe’s about 5 minutes away from me, so I’ll definitely grab a pack the next time I’m there!